Brunch is a staple in any food lover’s weekly routine, especially when you are on vacation. And in Traverse City there are plenty of places to brunch. It was hard to choose, but we picked three of our favorites and they all just happen to be very cozy too. The Towne Plaza is an intimate, comfortable spot that you’ll hear all the locals raving about. If you are a pork lover, this place is not to be missed! Chef Chris Hoffman has been influenced from culinary destinations including New Orleans, Italy and France. Using local ingredients -- and lots of pork -- his dishes reflect these culinary styles. The huge windows, beautiful wood tables, and decor give the restaurant an almost rugged, cabin-like feel complete with views of Downtown Traverse City. The lighting is also perfect to Instagram your food, which is always a bonus for us. Pictured is the Pork Belly, which is slow roasted and pan seared, then topped with fried green tomato, and goat cheese. It’s garnished with a creamy Tabasco vinaigrette and microgreens. This dish was fun and inventive - utilizing some of our favorite ingredients in a way we hadn’t seen before. Don’t worry if you aren’t a fan of pork, we also tried the Chicken Benedict, the Shrimp in Broth, and the Wild Game Chili. If none of these float your boat, fill up with pancakes, charcuterie, benedicts and more. Lunch service starts at 2 pm and dinner goes late until the evening, so you can get your fix all day long. If you find yourself in need of a bite to eat while exploring the Village at Grand Traverse Commons, don’t pass up the recently opened Red Spire Brunch House. Tucked away in the long, winding halls of the Mercato, is one of Traverse City’s best kept secrets for brunch and comfort food. Enjoy Red Velvet Pancakes, sandwiches, benedicts, omelets, and salads. You can even warm up with a brunch cocktail. We had to order the Monte Cristo. Seriously, you don’t find these on menus anymore! It reminded us of growing up when mom used to come home with them as a treat if we had been on our best behavior. Don’t underestimate the cherry jam that comes on the side. It was phenomenal! If you’re in the mood to get out of the snow and warm up with a cocktail, try the boozy but delicious Kickstarter. Complete with local Higher Grounds coffee, Kahlua, Irish Cream and whipped cream. No matter what you decide, you’ll be happy you stopped in. Patisserie Amie has been a long time favorite. 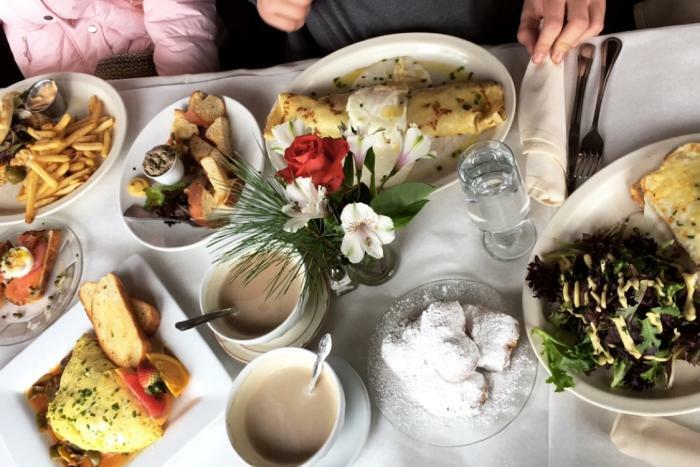 It’s a Traverse City staple for fine French cuisine, right in the Midtown neighborhood. Stepping in there makes you feel like you hopped off a plane in France and wound up in a lovely cafe. Small and bustling, you will likely wait for a table, especially on the weekends, so show up early. You can only make reservations for dinnertime. The food here is top notch quality, and most items are made in-house, like the smoked salmon. We started with a few cafe au laits and a creme brulee latte to warm up. The latte art was stunning, we might add! We ordered the salmon tartine, duck liver pate, ratatouille omelet, croque monsieur, crab mornay crepe, beignets and some frites. We left stuffed, and happy. You can’t go wrong here, everything was outstanding and perfectly plated. We truly couldn’t pick a favorite dish. If you have room for any more food, don’t forget their extensive selection of french pastries. We couldn’t resist a plate of the beautiful macaroons. Hungry for more? We’ve got you covered! Check out our page for recommendations of additional places to grub while in Traverse City.